If you want to find the best modern walk in tub units on the market, you’ve come to the right place. Aging Safely carries a wide variety of leading name brand walk in baths with hydrotherapy. We proudly sell Hydro Dimensions walk in bathtubs due to their incredibly high standards of quality. Simply put, Hydro Dimensions walk in tubs are as good as it gets. They come with every possible option you could want in a step in bath. With size and style options not easily found, you will appreciate the wide selection you can decide from. In addition, every model is fully tested for functionality and leak tested before it ever leaves the factory.Learn more about our deep soaker step in tubs here. When it comes to investing in aging in place modifications for the bathroom, you will want to make sure you get the latest and greatest technology. Hydro Dimensions carries several third party certifications and offers some of the most modern walk in bathtubs on the market today. With simple touch electronic controls that are really easy to use and look sharp. If you haven’t experienced the invigorating effects of warm air hydrotherapy, you might be missing out on your next favorite activity. Hydrotherapy has been utilized by humans for a very long time. However, like never before in history, people can get a full body massage by powerful water jets and effervescent air bubbles, in the comfort of their own home. Taking a hydrotherapy bath may even be good for you. Learn more about extra large walk in tubs here. 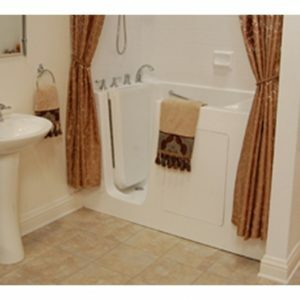 See why people all over the United States and Canada have chosen Aging Safely Baths as their trusted handicap bathing products supplier.